I struggle with keeping any type of routine. I make lists, I create prospective daily schedules, I make endless promises to myself to get more organized, work out, start a new (or another) project. I tell myself I need to start a better skin care routine, take vitamins, drink more water. All these things evade me. I live day-to-day beating myself up in my mind for not "getting it together." I mean, I DO get things done but some days I couldn't tell you how. I know, this probably sounds aloof and vague but I also know you probably totally get it. There is one thing that is a constant in my life. One ritual that has sustained as a continual routine that I live for every night: bedtime. I love sleep. I love my bed and its cool, comfy sheets and pillows. I love snuggling up with my pups and my partner and mentally decompressing with my book or my journal. I get such joy and satisfaction in putting my body to bed each night. I turn on the ceiling fan for a light breeze, I select which essential oil I want for the night and add a few drops to my diffuser, I apply a rose oil to my face and neck, roll on some under eye serum, and I anoint myself with jasmine body oil. I read for a bit before rolling over to flip off the lamp and turn on my white noise machine (usually set to ocean waves) and I touch each one of my bedside stones to say goodnight but also in hopes of absorbing the properties of these little talismans. It is perhaps the most simple part of my nightly routine. These little stones just sit there on my nightstand, exuding their beauty and tiny imperfections, and that is where they stay. Their role is just to rest there beside me. Yet, their simple presence is so meaningful to the ritual as a whole...the only one I can seem to keep on a regular basis. To me, it is not so much the potential for magic that these stones are said to possess, but that I have managed to keep this steady ritual and they are part of the whole experience. However, I do love a bit of magic in my life. Sunstone - Known as a joyful stone, Sunstone reflects and holds the qualities of light and the radiance of the sun. Like light, it stands for openness, benevolence, and warmth. Sleeping with this stone at your side will inspire personal power, freedom, mental clarity, and expanded consciousness. Dumortierite - This stone offers up the qualities of patience and courage. It induces calm and promotes detachment where you may need it in life. This stone is great for those who desire focus in their daily lives and strengthens assertiveness and self-confidence needed to achieve personal goals. Lepidolite - It has been said that this soft violet stone is a welcome talisman for those with turbulent emotions as it promotes stability and aids in tranquility and balance through life's transitions. Some use this stone as a point of focus in "looking before you leap." It stands as a reminder to breathe, consider the options, and act accordingly. Lepidolite is helpful in facilitating great awareness and observation. 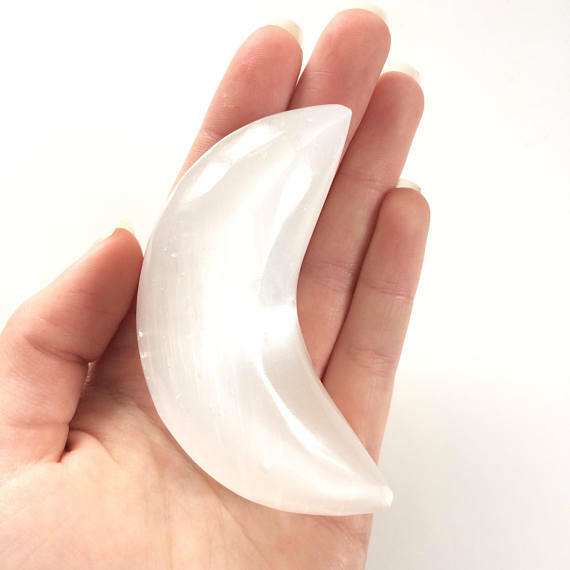 Selenite - A classic among "night time" stones, Selenite is often nicknamed "liquid light" as its energy seems to flow over your body and throughout the space it occupies. The name selenite is akin to Selene, the Greek lunar goddess, and therefore is associated with the powers of the moon. This stone is a healing stone and invites the cleansing powers of moonlight through your body and mind as you sleep. Trista Edwards is a senior writer at Luna Luna Magazine. She is also the curator and editor of the anthology, Till The Tide: An Anthology of Mermaid Poetry (Sundress Publications, 2015). You can read her poems at 32 Poems, Quail Bell Magazine, Moonchild Magazine, The Adroit Journal, The Boiler, Queen Mob's Tea House, Bad Pony, and more. She creates magickal candles at her company, Marvel + Moon.